Publication: the author paper will be added immediately to the "current" volume's Table of Contents after its acceptance. This International Journal is multidisciplinary peer reviewed Journal intended to publish original research papers in all main branches of science (All scientific disciplines) such as Social Sciences , Natural Sciences , Formal Sciences, and Applied science. (but not limited to): anthropology, archaeology, communication, criminology, education, government, linguistics, international relations, political science, sociology, Earth science, Ecology, Oceanography, Meteorology, Life science, Human biology, Decision theory, Logic, Mathematics, Statistics, Systems theory, Theoretical computer science, Applied physics, Computer science, all Fields of engineering, Accounting, , Education, Economics, Medical Technology, Biology, Medicine, Management, History, Mineralogy, Civil Engineering, Marine Technology, Commerce, Chemical Engineering, Animal Sciences, Petroleum & Gas, Energy Resources, Agriculture, Medical Sciences, Machine Learning, Machinery, computer Science, Chemistry, Neural Networks, Physics, Social Science, Geology, Transportation, Waste Management, Control Engineering, Applied Mathematics, Oceanography, Biomedical Materials, Construction, Metallurgy, Neural Computing, Industrial Arts, IT, Astronology, Fire & Fire Prevention, Robotics Marine Sciences, Solid State Technology, Business Administration, Food &Food Industry, Atmospheric Sciences, Artificial Intelligence, Textile Industry & Fabrics, Education science, Physiology, Nano Science, Microbiology, Psychology, Statistics, Pharmaceutical Sciences, Genetics, Botany, Veterinary Sciences, Biotechnology, Biochemistry, Zoology, Oncology, Accounting, Entomology, Parasitology, Evolution, human behavior, Biophysics, Fisheries, Pharmacology, Geography, Cell Biology, Genomics, Plant Biology, Law, Religious Studies, Endocrinology, Dentistry, Infectious Diseases, Toxicology, Immunology, Teacher education, and Neuroscience. This International journal Guarantees that the editor decision based on the peer review results will not exceed 21 days from the paper submission date. The International Journal of Sciences: Basic and Applied Research ( IJSBAR ) is published and hosted by the Global Society of Scientific Research and Researchers (GSSRR). The GSSRR is created to provide services for the research and researchers community with low or no cost. The scientific research publishing department in the GSSRR is responsible for publishing a collection of scientific journals called the International Journals of Research Papers (IJRP) . 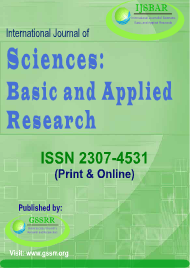 The International Journal of Sciences: Basic and Applied Research (IJSBAR) publish original research papers, review articles, short communications and technical reports in in all main branches of science (All scientific disciplines). Ulrich, Google Scholar , Directory of Open Access Journals (DOAJ), Ulrich's Periodicals Directory, Microsoft academic research, University of Texas (USA) , Stanford University (USA), State University Libraries of Florida (included in 11 universities libraries in Florida)(USA), University of Cambridge (United Kingdom), Simon Fraser University (Canada), University of South Australia (Australia), OAIster database, PubZone (ACM SIGMOD), Research gate, OCLC World Cat, IE Library ( Spain ), Elektronische Zeitschriftenbibliothek (Ezb germany), Simpson University (USA), Columbia University (USA), NEOS library consortium (Canada), University of Melbourne (Australia), Technische Universit Darmstadt (Germany), University of Gronignen (The Netherlands), University of Liverpool (UK), University Wurzburg (Germany), Academic research (ourGlocal), Issuu, Researchbib, Journal seek,docstoc, ProLearnAcademy, ectel07, University of Canterbury (New Zealand), University of Hong Kong, Queen's University (Canada), University Mainz (Germany), University of Saskatchewan (Canada), The Hong Kong University of Science & Technology, University of Manitoba (Canada), Auckland University of Technology (New Zealand), scribd, prorch, slideshare, mendeley, academia, Genamics JournalSeek, Internet archive, Ebookbrowse, CiteSeer, Physikalisch Technische Bundesanstalt (Germany), University of Twente (The Netherlands), University Osnabr (Germany), University Marburg (Germany) , University of IOWA (USA). IJSBAR is multidisciplinary peer reviewed Journal intended to publish original research papers in all main branches of science (All scientific disciplines) such as Social Sciences , Natural Sciences , Formal Sciences, and Applied science. The IJSBAR welcomes the submission of scientific articles in all scientific fields for this year 2017. Publish your paper with IJSBAR Journal. (2016\2017). The GSSRR is creating new international journals in all scientific areas; and thus we are looking for Candidates for Editor-in-Chief for those journals. The International Journal of Sciences: Basic and Applied Research (IJSBAR) released the new logo and cover for the 2014. You’ve got your PhD or Master's or even your graduation project. Well done! Congratulations. You should probably begin to consider getting it published. We are looking for Editorial Board Members if you have PhD degree with minimum 5 years teaching experience you can apply. Download, fill and send form in soft copy. IJSBAR is published by (GSSRR).